Bishop William LaRue Dillard received a heart transplant at 78. "It's the size of the heart that matters." Bishop William LaRue Dillard was speaking quite literally when he shared this detail of how he came to be an 81-year-old clergyman with a heart 43 years younger than the rest of him. He quoted his heart transplant surgeon as he sat in his office at the Second Baptist Church, surrounded by framed photos of his children and grandchildren, describing the traits necessary for a donor heart. After months of waiting, on Sept. 5, 2014, Dillard and his wife, Betty Gay Dillard, got the call: "We have a heart for the bishop," said Jon Kobashigawa, chair of Heart Transplantation Medicine at the Smidt Heart Institute. Dillard was 78. The heart came from a 35-year-old father of four. "The size of his heart fit right into mine," said Dillard. "It has been a monumental moment in my thinking, reflecting on his transition and my reception of that heart, which came just in time." Dillard had been plagued by fits of coughing, trembling and shortness of breath for a while, but one morning he had a particularly frightening attack and decided he couldn't ignore them any longer. "I knew something was drastically wrong," he said. "I went straight to my doctor. The nurses took one look at me and said they better get me in right away." He was admitted to a local hospital, and a cardiologist referred him to the Smidt Heart Institute, where Dillard met Kobashigawa. Along with Dillard's previous diagnosis of an enlarged heart, Kobashigawa found he also had cardiac amyloidosis, a rare condition in which an abnormal protein builds up in the heart. The only hope was a heart transplant. Some heart transplant programs would have considered Dillard too old to undergo a transplant at 78. But researchers at the Smidt Heart Institute have studied transplants in older patients and found that select patients age 70 and older can undergo transplantation with similar outcomes to younger recipients. "Today, you'd never know he'd had a heart transplant," said Kobashigawa. "Every patient here gets a fair and objective evaluation, and we really weigh each case very carefully. We're happy we could help him." The support of his congregation and the love of his family were instrumental factors in his recovery, said Dillard. The bishop shared his worries with the congregation, and they prayed for him. "The skill of the surgeon, the discoveries that make operating rooms, anesthesia and heart transplants possible—these are gracious and miraculous gifts," said Dillard. 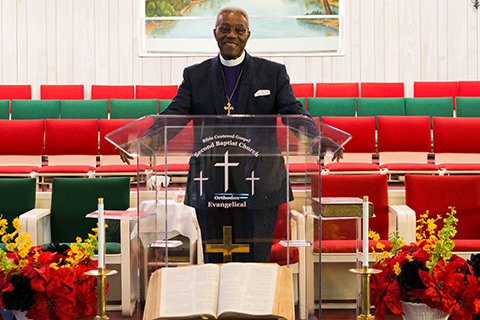 Dillard still leads the Second Baptist Church in Monrovia, where he's served the parish since 1974. He and Betty—whom he affectionately calls "Apple Blossom"—have five kids, a son-in-law and three grandkids. It's the size of the heart that matters, and these days, Dillard's is overflowing with optimism and happiness.